Travis S. Williams, Esq. will be an adjunct professor in the Business Department for the 2013 Fall semester. As an Arizona native and resident of Gilbert, Williams is excited to continue to service the community. Williams brings nearly 13 years of business law experience to the classroom. Currently, he is a Senior Counsel Attorney at The Frutkin Law Firm, working with institutional lenders, private lenders, small to medium-sized businesses, and real estate developers. His practice areas include real estate and business transactions, lender transactions and business formation. 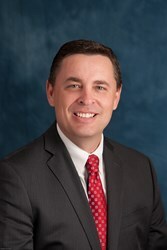 Williams graduated from the Sandra Day O'Connor College of Law in 2000 after he earned his Bachelor of Arts degree from Brigham Young University in 1997. He has memberships and affiliations with the Arizona Supreme Court, U.S. District Court of Arizona, and Bankruptcy and Real Estate Sections of the State Bar of Arizona. For more information on Attorney Williams or The Frutkin Law Firm, PLC, visit http://www.frutkinlaw.com. With offices in Phoenix and Scottsdale, The Frutkin Law Firm consists of ten attorneys with decades of experience in the core areas of civil litigation, business law, bankruptcy, and estate and tax planning.